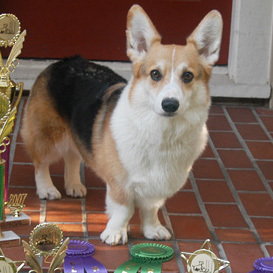 There remains some controversy about how antiques should be treated. Do we conserve, restore, polish, leave an old finish as is, strip a finish that looks to have seen better days, remove materials that are original but may cause damage because of their natural components, repurpose a piece of furniture which is of a style that doesn’t sell well anymore? To say that all furniture should be kept original or that all brass should be polished or that all wood backboards of frames should be removed ignores the question of what is our respective duty to the antiques world. Conservation is the art of maintaining and stabilizing the structure of objects that have been damaged or poorly repaired in the past. It is based on the idea of “first do no harm” in that it attempts to keep objects as close to the condition in which they are found today, after years, decades or centuries of wear, tear, and patina build up. Conservation also seeks to stabilize objects so that no further harm comes to them. Now, back to the dilemma of whether to conserve or restore: a good case in point to explore is the tall case clock made by Peter Stretch and owned by Winterthur Museum. The clock was acquired by the museum in 2004, about 2 years before I attended a conference on understanding “original” finishes. The case of the clock was in fairly bad repair with missing veneer, cracks, paint loss, missing dentil ornaments in the bonnet, missing feet, and a large crack in the base. The finish of the case had darkened and had so much heavy cracquelere that the beauty of the crotch mahogany figuring was virtually invisible. At the conference, the question of whether the clock should be restored so that visitors could see the clock as it was meant to be seen was asked of us. About half were for leaving it completely alone with the rest of the group split between minimal conservation and total restoration. Winterthur spent several years seeking consults from the highest authorities in the antiques world and of museum visitors about what to do. Eventually (and fairly recently), the museum conservation staff set about minimally conserving the piece while adding a few missing elements to make it more presentable. The dark and crackled finished which obscures the figuring of the mahogany remains as it was received. Clearly, Winterthur made a compromise between three possible approaches. If you want to learn more about the conservation of the Stretch Clock, see "Furniture Conservation: A Study in Challenges - The Peter Stretch Clock". So what are we to do with our antiques? My personal belief is that the end consumer, i.e. the collector, has the right to treat the antique as she/he likes. If a collector of Federal period furniture likes a high gloss finish like the furniture would have had when new, then the collector can have the piece restored so that it looks like it would have in 1800. However, antique dealers are just the middlepersons and our duty is to preserve antiques as close to the condition in which they are currently found for the final end user, the collector. We have an ethical obligation to preserve and conserve, not to make irreversible changes. Ethically, I really don’t have the right to replace a part unless the replacement is reversible and I keep the original part for my buyer. As a dealer of antique artwork, I don’t have the right to glue down a silhouette that has been removed from the backing without breaking ethics. Even though I know that wood causes acid deterioration to artwork, ethically I cannot remove the wood backboard of a frame unless I keep that backboard for the buyer. I cannot, ethically, replace original blackened paper or fabric from behind a hollow cut silhouette unless I keep the removed piece with the silhouette for the end user. I cannot, ethically, have a portrait miniature removed from the original jewelry case unless I keep the two pieces together for the ultimate owner. Recently, I purchased a silhouette by Edouart from his rescued folios. If you are not familiar with the great Silhouettist Edouart and his duplicate folios, you can read a short biography about him on my Silhouettist Biographies page. The images in the internet listing from which I bought the silhouette showed that the silhouette had been removed from the folio page and was loose from any backing paper whatsoever. 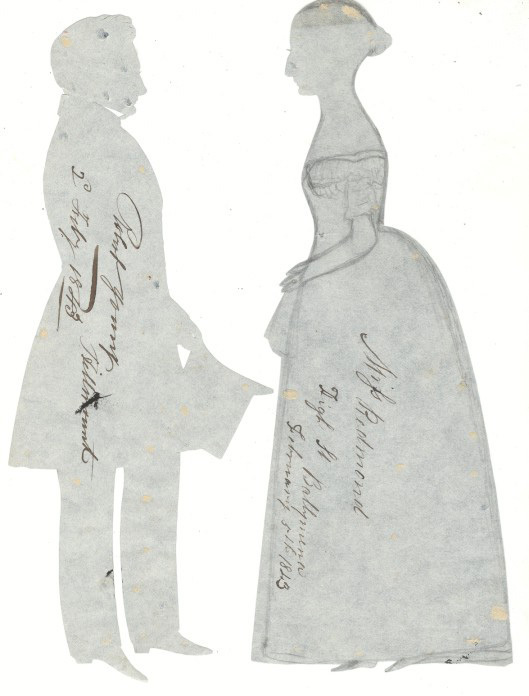 The back of the silhouette was photographed (unattached to anything) showing Edouart’s rarely-found pencil doodles on the back. See top image to the left. These Edouart duplicates with pencil doodles are rare although their existence is certainly no secret. I’ve owned the one shown in the second image on the left since 1994 and used it as a teaching tool for talks I give about antique silhouettes. The Laughons’ book August Edouart A Quaker Album published the image of penciled reverse in 1987 at page 5. Edouart did not draw on the back of all of his silhouettes, nor all of his duplicates. As you can see by the image of Young & Redmond, the gent does not have pencil drawing but the lady does. Both silhouettes come from the same page of the folio, as shown by the names written on the paper below the duplicates. See third image. In 1921, Mrs. Jackson published images of the reverse of a full length and bust length duplicate, both without pencil drawings. See Jackson, Mrs. F. Nevil, Ancestors in Silhouette by August Edouart, The Bodley Head, London; John Lane Co., New York, 1921, at the Plate opposite page 6. The silhouettes with pencil doodles are seldom found and greatly coveted. While most Edouart silhouettes are valuable, the pencil doodles on the reverse increases the value over one without the doodles. I delightedly bought the silhouette from a description that did not say anything about the silhouette being subsequently glued back down. I certainly never dreamed that someone who professes to know better than just about anyone else about silhouettes (as this seller frequently does) would glue the silhouette down. Why would anyone who understands antique artwork of any kind, glue the artwork down? I received the silhouette, in a frame about a month before I was scheduled for major back surgery and at a time that I had a hard time getting out of bed, let alone opening a frame to see if some numbskull had glued down a silhouette that is worth more because of its back than the front. Needless to say, I did not open it until many months later when I had a possible sale at hand. Surprise! The silhouette had been glued down onto paper with big blobs of glue, the gent’s feet totally glued down and the front of the silhouette showing two marks directly opposite of the location where two big blobs of glue had been put on the back--the black on the front of the silhouette had lightened because of the glue. Upon questioning the seller as to what kind of glue was used because I now have to add the cost of having a paper conservator remove the silhouette, I was reminded that cut & paste silhouette are always pasted to the backing card. Well, it is true that 19th century cut & paste artists pasted their silhouettes to backing cards. That is, after all, what a cut & paste silhouette is, by definition. But here is where the decision of whether to restore or conserve comes into play. Why glue when today one can walk into any art supply store and purchase Japanese rice paper which is archival and holds very lightly so that it can be easily removed? Why even attach the silhouette to the back when you are laying glass right on top (as this seller did) and you can hold it in place with compression? In my opinion this seller made a grave mistake and caused irreparable damage to this antique by not thinking about what his future buyer might want and not working to do no harm. I will incur additional cost for this silhouette and, even if the conservator can successfully remove from the backing paper with no additional damage, the staining to the front of the silhouette from the glue has permanently devalued it. In the end, I’ll probably sell the silhouette pair that I already owned to the Edouart collector whom I have already told about the recent acquisition as a replacement for this one and put this one into that part of my collection which is used to illustrate my lectures. It does, after all, present a valuable teaching moment!